This week at the library; or, No post-holiday let-down here! Tuesday - held off the post-holiday letdown (not that I actually celebrated the holiday, but whatever) by spending $2,000 on books. Yay! Sent my January order early, b/c I will need lots of new books for a program, and ordered lots of new nonfiction from Bearport! Also had a staff meeting and we decided, sadly, that middle schoolers not actually "using" the library will be asked to leave. No more hanging out at the library. Sigh. Wednesday - suddenly realized exactly how I will run my new program, the Elephant and Piggie Club. Trying to plan programs in between end of year magazine weeding, new books, etc. etc. Short week! I celebrated New Year's by continuing to unpack, going to Ikea, and starting work on cleaning up my blog and LibraryThing catalog, both much neglected since my loss of internet in November. I am cautiously optimistic about the internet I have gotten from US Cellular...beware company, if you fail me a children's librarian's curse will fall upon your head! In Binky's first two adventures, he successfully built (sort of) a space rocket and then ventured into outer space itself to protect his best friend from space aliens. Now, in Binky Under Pressure, Ashley Spires delivers another uniquely delightful story of a cat unlike any other. Binky's life has become routine, his daily round monotonous. Then Gracie appears. At first Binky is suspicious and very, very unhappy about having another cat in the house. Until Gracie's secret identity is revealed! Now Binky will have to prove his worth as a space cat all over again, or be kicked out of F.U.R.S.T. Does he have what it takes? Will he and Gracie ever be friends? Verdict: This series remains fresh and funny, with new twists and characters keeping the story alive throughout this third installment. If you already have the first two Binky books, you'll need to add this one. If you missed out, add all three! 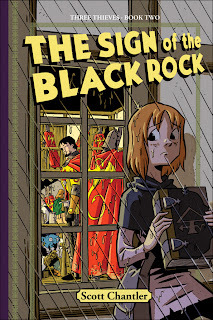 The Sign of the Black Rock is the next installment in Scott Chantler's exciting Three Thieves series. The first book introduced us Dessa, a young down on her luck acrobat and her two friends, the massive Fisk and thievish but not too clever Fisk. They unsuccessfully tried to burgle the queen's tower and are now on the run, with mysterious and soldiers following them all the way. I was disappointed in this book because none of the plot lines left dangling in the first episode were cleaned up, just made more mysterious. We're introduced to a whole new cast of characters, smugglers, an unpleasant innkeeper, his abused wife, and we see some of the earlier characters return, but we're no closer to finding out Dessa's secrets than she is. The story is fast-paced and interesting and I like the colorful art, but this book's intended audience are likely to lose interest if the story doesn't give up some secrets soon. Verdict: Great art, and possibly interesting plot, but insanely annoying cliffhangers. An adult might hang on for more sequels (well, maybe not this adult) but most tweens will lose interest in the series quickly. I recommend waiting until the whole series - or a more substantial number of titles - are available before buying or reading. 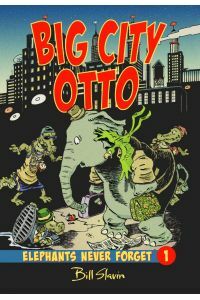 Now Bill Slavin's Big City Otto, first in the Elephants Never Forget graphic novel series, is a good example of leaving enough of the story for future volumes without confusing or exasperating readers. Otto is miserable. He just can't forget his childhood friend, Georgie the monkey, although he's been missing for a long time. Crackers the parrot suggests that they try to find Georgie, and the two of them set off for America. But finding a small monkey in the big city isn't as simple as they had thought and soon they've been separated and Otto has gotten mixed up in a notorious gang of gators. Will Otto forget his old friends, or will he prove he's an elephant and remember they need him? 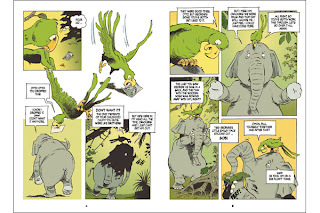 The quirky illustrations have a strong comic strip flavor and the plot dances through gators bedecked with bling, sneezing elephants, gypsies, zoos, escaped animals, and the mysterious villain, the man with the wooden nose. Although Otto doesn't find his friend Georgie, he and crackers break up a criminal gang and learn that there's a lot of world out there. They end the story with a new clue and the determination to keep searching for their friend, no matter what. Verdict: This is an interesting new series; hand it to kids who like mysteries with some funny elements in it. The talking animals may be a problem for most mystery loving kids, who in my experience like their mysteries very realistic and conventional, but this would make a fun read-aloud for a younger child as well. Luz sees the light by Claudia Davila is the first in a new series, The Future According to Luz. Luz begins the story as a typical suburban kid, saving up for the shoes she's sure will make her popular, playing videogames and begging her mom for rides to the mall. But rising gas prices, blackouts, and new friends change Luz's life. Now her family is working on buying local food and goods - which means the European shoes she longs for are out of the question. There's no more driving to the mall; she'll have to take a bus. Luz is miserable until she has a vision of what could be...and she decides to try her own project, reclaiming a vacant lot as a community gardens with local art, a park, farmer's market, and communal organic gardens. Her new friend Robert gives her shoes he designed himself and their freaky weird survivalist neighbor turns out to know quite a bit about how to make the world a better place for everyone. The book is drawn in black, white, and brown shades. The simple art shows the rapidly changing emotions of Luz and her friends and how the vacant lot grows into a wonderful gathering place for the community. I didn't buy Luz's sudden transformation from oblivious consumer to activist and quite a bit of the dialogue comes off as preachy infodumps. I think it would have worked better to have the information put into side panels instead of having the characters deliver lengthy explanations of what they're doing to survive the energy crisis and create a healthier, sustainable world. Verdict: Good art and it's great to see a cast of multicultural characters, but too much lesson and not enough plot make this a rather blah read without much kid appeal. School librarians may be interested in purchasing this if their school does projects on sustainable living and it might be a good purchase for your library is there's interest on this topic in the community, as this is a good introduction for kids. **Holiday** Carol Hampton Rasco presents Under the Tree... at Rasco from RIF showcasing a family tradition and lots of new holiday titles. Eric Van Raepenbusch presents Happy Birthday William Joyce - December 11, posted at Happy Birthday Author. He has instructions for making Cocoa Moon Craters to celebrate William Joyce's birthday and his new book, The Man in the Moon, first in the Guardians of Childhood series. GT Laden presents Harry Potter: Books cf Movies, posted at Greg Laden's Blog. Check out some Harry Potter stats! My own contribution to this month's carnival is some stats on this year's Cybils Nonfiction Picture Book Nominations, posted here at Jean Little Library. Lisa Ard presents Struggling with a book description, posted at Adventures in Writing and Publishing. This post discusses manuscript pitch, synopsis and description. Catherine Nichols presents Cybils Nominee: Toys Come Home, posted at The Cath in the Hat. J McManus has offered her stories about Talee, Anyia, and Nola for free at Read My Books for Free, posted at Journey of a Storyteller. Ali B says novels about Vikings seem to be popular at the moment with UK publishers, and she has a round-up of her favorites, Norse Code, posted at Fantastic Reads. **Holiday** Read Aloud Dad presents The Ultimate Christmas Read Aloud Collection, posted at Read Aloud Dad. Pamela Jorrick presents her 13 year old daughter's review of Midnight Blue, posted at Blah, Blah, Blog. Pat Zietlow Miller presents KID REVIEW: Sophie dives into Bluefish, posted at Read, Write Repeat. 11 year old Sophie gives the high points of Bluefish and Pat offers some additional thoughts and links. Margo Tanenbaum presents a book review of Jefferson's Sons: A Founding Father's Secret Children by Kimberley Brubaker Bradley, posted at The Fourth Musketeer. Margo says this is one of her favorite historical fiction releases this year - check it out! **Holiday** Melissa Taylor presents an Educational Gift Guide for Kids: Books, posted at Imagination Soup. She says these are her favorite and what she thinks are the best books of 2011 - and I can tell you all, there's an amazing variety! Books for very young children, funny books, craft books, graphic novels, fiction, nonfiction, it's all there. Start making notes for next year! Keely Parrack presents A Monster of a Writer - Newbery Ponders, posted at Fragments. "A critical analysis of the writing in the first page of A Monster Calls by Patrick Ness as part of Newbery pondering." This would make an interesting resource for a book club - especially if you have an adult book club that's interested in reading some children's literature. **Holiday** Jama Rattigan presents Loving Lisa Schroeder's Sprinkles and Secrets posted at Jama's Alphabet Soup. Enjoy her review and then follow the recipe for yummy cookies! **Holiday** Kate Coombs presents a YA Holiday Extravaganza of book suggestions at Book Aunt. She says, "Take a look at 9 books for YA readers--adventure, paranormal, mystery, realistic fiction, dystopian, and fantasy! Eight are new and the 9th won this year's Schneider Family Teen Book Award." Brenda Kahn presents a review of Bluefish by Pat Schmatz, posted at Proseandkahn. Katie Davis presents Best 20 Books of 2011 posted at Katie Davis, Author/Illustrator. This is a podcast interview with two amazing librarians, Travis Jonker and John Schumacher! Shirley Duke presents her latest book, Environmental Disasters, posted at SimplyScience Blog. The book explains and discusses past and recent disasters and their impact on the environment and Shirley also provides some related activities. Corinne Robson, Associate Editor presents a Week-end Book Review: Drawing from Memory by Allen Say, posted at PaperTigers Blog. Jeff Barger presents a Nonfiction Monday post on Catherine Sill's About Hummingbirds, posted at NC Teacher Stuff. He says, "The artwork in About Hummingbirds is beautiful. 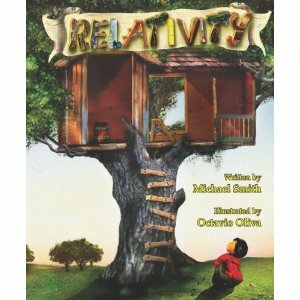 It has a great mix of easy text in the narrative and detailed facts in the back matter." Sandra McLeod Humphrey presents Dare to Dream Big: from social nonconformist to world renowned philosopher and writer, posted at Dare to Dream Big. Her blog is part educational, part inspirational and each week she posts a new biography of someone who overcame great obstacles to attain their dream. Kathy Stinson presents An Intimate Examination of Sock Fluff - Part 1, posted at Turning the Pages: Kathy Stinson's Blog. That concludes this edition of the Carnival of Children's Literature. Submit your blog article to the next edition of Carnival of Children's Literature using our carnival submission form. Past posts and future hosts can be found on our blog carnival index page. (Yes, we have been around since 2006!) For an email reminder of the location of the next carnival and announcement when it is posted, subscribe to Booktalking. After ten years in increasingly miserable orphanages, Kate, Michael, and Emma are given one last chance at a mysterious school in Cambridge Falls. Kate is the only one who remembers their parents and she is determined never to forget their promise to return, and never to forget her promise to care for her younger siblings. Michael is obsessed with dwarves, a book of dwarf history his only link with his parents. Emma has no memories of her parents and learned that she must fight for everything - and she does. Strange magic, startling discoveries, trips back into time, betrayals, magical creatures, etc. etc. and so on ensue. 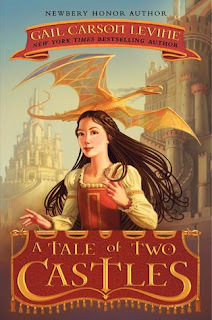 I read this book with mild enjoyment, but I can't see much difference from the "children without parents go on a quest" themed fantasy that seems to get churned out every month. Every book is going to be the new Big Fantasy, every one is touted to the skies, and they all seem to fall short. 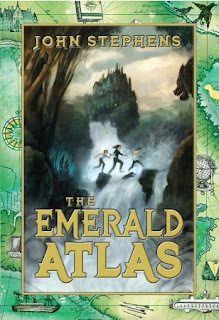 This was a good read, with plenty of adventure and mystery, and although the characters were somewhat stereotypical (Kate is the Responsible Oldest Sibling With Guilt, Michael is the Quiet Middle Boy Who Knows Things and Emma is the Tough Youngest Girl Who Wants To Be Treated With Respect) Stephens flips this in a few cases as their desperate desire to have their parents back leads them to actions that betray each other. The dwarves were a humorous addition, although adding them doubled the weight of the plot, and I'm still deciding about the Noble But Aloof Natives. Thick middle grade fantasies, the thicker the better, seem to be the order of the day. However, in my circulation statistics and in what I have observed, the market for these is rapidly declining. A small number of tweens read voraciously and can't get enough of these doorstopper books. But an even larger percentage are discouraged by such thick tomes. For example, the circulation of my juvenile series section (all thin chapter books and taking up two ranges of shelves) is about 3,000 a year. The circulation of my juvenile graphic novels (less than one range of shelves) is about 3,000 a year. The circulation of our juvenile fiction (mixture of thick and thin chapters, heavy on the thick, and cover about 4 ranges of shelving) is about 3,000 a year. Get my point? I would like to see fewer series, and more slim volumes, like Gordon Korman's excellent quartets and trilogies of adventure stories that are broken in manageable bites. With shrinking budgets and shelf space and waning interest in reading, I'm looking for fantasies that stand out - and this one just doesn't. Verdict: I did actually buy this one, since it hit the bestseller list and was lauded on many blogs and in reviews. I wish I'd had the time to read it first, as I now rather regret that and would recommend only buying it if you have a large population of thick fantasy readers or a generous budget. As it seemed to work well last time, I've arranged the posts by Dewey number, more or less. The Nonfiction Detectives have a review of Just a Second by Steve Jenkins. 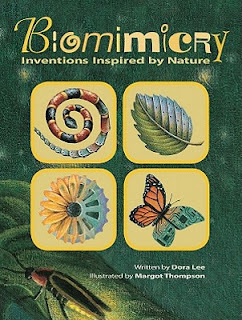 As the cover shows, this book is all about inventions modeled on nature; biomimicry, the imitation of life. The book begins with a discussion of how humans are destroying the planet, but learning from nature a more sustainable way of life could help save it. We see inventions from the past that are based on principles found in nature; camouflage, Velcro, and even the motor. The bulk of the book is divided into sections examined different sciences where inventions are being modeled on natural organisms - or could be. "Shaped for survival" - how about a house air-conditioned like a termite mound? "Smart Structures" - or did you know Olympic swimmers wear swimsuits inspired by sharkskin? "Magic materials" - will scientists one day be able to recreate the amazing substance of nacre, produced by shells? These and many move inventions, past, present, future, and theoretical are presented as well as problem-solving - like observing a kingfisher to improve bullet trains or copying natural spirals to make energy-efficient, quiet fan blades. This is a fascinating topic and I like the overall design of the book, each spread having an introduction to the particular scientific area and then a 3 or 4 paragraphs on different inventions or possible solutions. I did think the book emphasized the "we're destroying the earth" theme a little too much; it wasn't really necessary and could have been briefly mentioned in the introduction. However, the one thing that takes this book down from "amazing" to "ok" is the illustrations. I really wanted to see side-by-side comparisons of the some of the different organisms and man-made materials and structures, but the pictures almost exclusively show the natural part of the equation. The cover was the best of the illustrations and I was disappointed that the interior pictures didn't match it. The art is textured and grainy, acrylics on canvas, and doesn't give the detail and depth I needed to better understand what was being explained. The illustrations aren't "bad" just not, in my opinion, suited to the book. 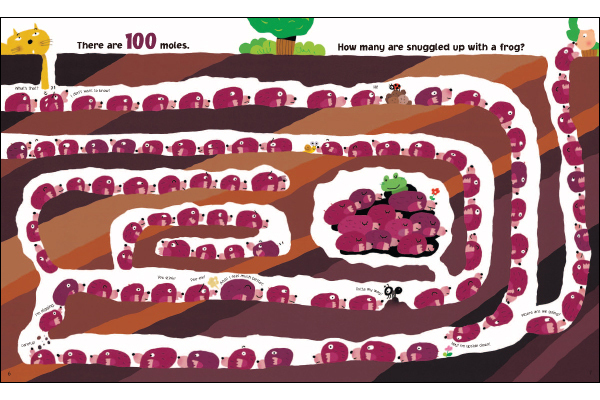 Verdict: This is a cool topic and one kids will be interested in, but the unappealing illustrations and lack of detail will make it hard to hold kids' attention. This is a nonfiction title that would have benefited from photographs. An additional purchase. This week at the library; or, Happy Holidays at the library! Basically spent Monday through Thursday finishing weeding projects, shifting books, working on marketing and publicity, and packing up and cleaning my apartment. Trying to explain to a patron that Facebook really isn't the ideal medium to look up deceased relatives and friends. Moving all our I Spy, Look and Find, and similar books into one section. Yay! Whilst weeding the picture books found a book talking about a kid "diddling" his cereal. Ah, the evolution of words. Also found a book featured Noah's Ark, only set in the 1960s and Noah takes all the animals into a big boat because no one will listen to him and stop pollution. When everyone finally cleans up the earth, he releases all the animals and they don't need zoos anymore, because when the big cats were fighting he told them to stop because they were behaving like people and now everybody loves each other! Oh, and they don't need clothes anymore - by the end of the book all the kids are naked. Realizing that I was supposed to be sending press releases to the local paper all last year - I thought someone else was doing it. Doesn't seem to have harmed our numbers, since we hit 8,800 in program attendance for the year! Warned middle schoolers about our new policy - if you get kicked out, your name gets written on THE NOTEPAD OF DOOM and your parents get called. Two boys told me "we're sixth graders. we don't do doom"
This policy lasted two days, then we had ANOTHER meeting, realized it was completely useless (how do we get kids' names?) and it looks like we're just going to be turning away any large groups of kids that want to hang out at the library. There's an after school place staffed by church volunteers they can go a few days a week, otherwise they're just going to have to go...where? who knows? Somewhere else. I hate this, but there seems to be no other solution. I can't fix these kids' lives, I can't make their parents care enough to make after school care arrangements for them, so the best I can do is tell them they're welcome to study, read, and use the computers at the library, but otherwise they're not welcome. We don't have enough staff to offer free after school babysitting services. Finally, on a lighter note, a few pictures of our new parenting and I spy collections and the reorganized shelves. Added more shelves so the board books extend all the way around (with flu season decor above) don't look too closely - I just dumped all the extra board books on the shelf! There's no future for Elodie on her small, isolated island and her parents have made the painful decision to send her to the mainland as apprentice to a weaver. But Elodie has her own plans. She's going to be a mansioner, an actor. She's going to apprentice herself to the mansioners in the town of Two Castles and become famous. But things don't work out the way she plans. Her naivety, inexperience, and poverty get her into endless problems and the homely wisdom from her parents is no help. Life in the town isn't at all what she expected and she sadly realizes that not only can she not apprentice to be a mansioner, she can't afford to apprentice to anyone. Except the dragon. Elodie is frightened but intrigued by the eccentric dragon Meenore, who also dreams of something more interesting than her jobs as a street cook and fire starter. And then there's the ogre, Count Jonty Um, feared by all the townspeople. Elodie will have to decide what she really wants out of life and who she can truly trust if she is going to make Two Castles her home and survive the intrigues and dangers in the city. Elodie is a lively and interesting character and Two Castles is a well-drawn fairy tale town. But I didn't care for this story; probably because I read it immediately after reading a more conventional fantasy-adventure. It reads very much like a traditional folk or fairy tale, but it was hard for me to maintain interest in the odd characters throughout an entire novel. The royal family were especially unbelievable, as though they had stepped straight out of a fairy tale. It's been a while since I read Levine's other works, so I had forgotten what her style was like. Verdict: While I didn't personally care for this story, kids who like characters they can relate to, like drama-loving Elodie who is constantly embarrassing herself, with a topping of fairy tale fantasy will love this. Levine's writing is funny and dramatic by turns, just like Elodie, and kids will like the unexpected turns of the plot and the odd characters. Try this one on kids who don't like conventional fantasy-adventures or are already fans of Levine. 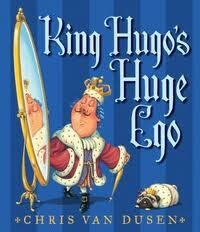 King Hugo may be a diminutive monarch, but his ego is monstrous. He insists on giving lengthy and boring speeches about his grandeur to his annoyed subjects and constantly boasts. But he makes a mistake when he pushes a poor farm girl into the mud...because she's really a sorceress and she demonstrates to everyone just how much power has gone to Hugo's head. There's not much plot or characterization in this cheerful rhyming story, but children will enjoy listening to the Seussish couplets and Chris Van Dusen's rich colors always make for delightful illustrations. If you're looking for a moralistic tale on the follies of pride, this isn't it, but as a fun diversion it's, well, fun. Verdict: Not an essential purchase, but a fun addition to your picture book section, especially if you have fans of Van Dusen's other nonsense stories. I wanted to like this book. It's gotten some really good reviews and I usually enjoy Nat'l Geographic's animal books for kids and middle grade readers. But it left me unsatisfied. Is it a book about photography? About animals? About preservation? About science? A little of each, but not enough of any, was my feeling. Like a coffee table book only for kids. I admit some of this ambivalence comes from my preference for close up, detailed photography, like Nic Bishop's work or the photography in the Scientists in the Field series (a lot of which is his work anyways). The big picture just doesn't really grab me. 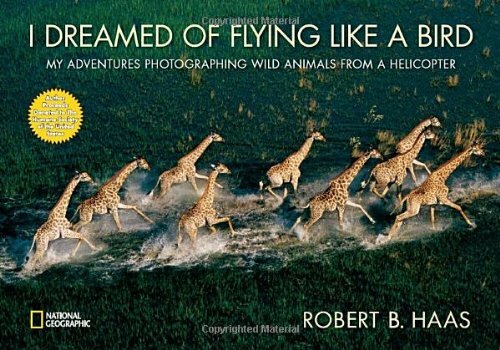 If you're one of the few people who haven't seen this book yet, it switches back and forth between Haas' career as an aerial photographer, with photography terms, tricks and dangers of the trade and a little about his background and the context and background of some of his most famous photos. Hmm. I think what bothered me about this was I had a hard time connecting the text to the photographs. After I'd read the book a couple times it was easier to connect the text to the progression of the photographs, but I think it would have made a big difference if the book had been laid out differently, or maybe the photos had captions. Some can easily be connected to the story - like the buffaloes and lions, while others like the whales are confusing, since some photos seem to be random whale shots and others are specifically described in the text. Verdict: This book wasn't for me, but quite a few people have fallen in love with it. If you feel a need for a photo heavy, general animal book in your nonfiction section, go for it. I'll stick with Scientists in the Field and Nat'l Geographic's Face to Face series. This week at the library; or, last programs! Tuesday I left about 8:15 and went to the hardware store to pick up masking tape, which I needed for our big program. I set up the room, met the performers, ushered in classes from the daycare, talked to moms, and by 10am we were set for Kohls Wild Theater - we had about 150 people, included 100 kids from a local preschool/daycare. It was a blast - if you're in the vicinity of this program, go for it! Great program, great performers, and the kids and parents loved it. Then I reset the room (sort of) and started frantically restocking my decimated displays, a couple hours on the desk, took some stuff over to the school, ran home for something to eat, set up the Storyroom for my last program, cleaned up glitter left from previous programs, back to displays, final program - our last Make it and Take it *sniff* we made glitter pinecones, glitter snowmen, and pompoms. Wednesday I showed up...rather late for work. Got caught up writing reviews at home. We had another cookie decorating program, run by Miss Pattie, and another informal "what are we going to do about those kids!" meeting. Argh! Middle schoolers, you are not doing a good job of convincing anyone you should be allowed in the library! Displays, publicity, program planning, and more chortling over the Lift the Flap Human Body book. Thursday - marketing and publicity for January/February and more and more and more and more and more book bundles. I can't keep up! Received a package from Better World Books and couldn't figure out who was sending me books, until I realized duh, Ms. Yingling!! Thank you!! Friday - more publicity and a trip to Milwaukee to a Scholastic Warehouse sale. Saturday - the publicity continues, as do the computer questions. 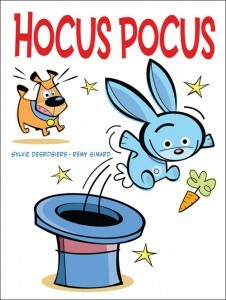 Sylvie Desrosiers and Remy Simard have created a visual delight in this new wordless picture book, Hocus Pocus. Mister Magic's dog, relaxing at home after a hard day's work, is disturbed by the hungry rabbit in the hat, who has plenty of schemes in mind to get that coveted carrot. Jokes and accidents abound until Mister Magic awakes and all ends happily - for the rabbit. 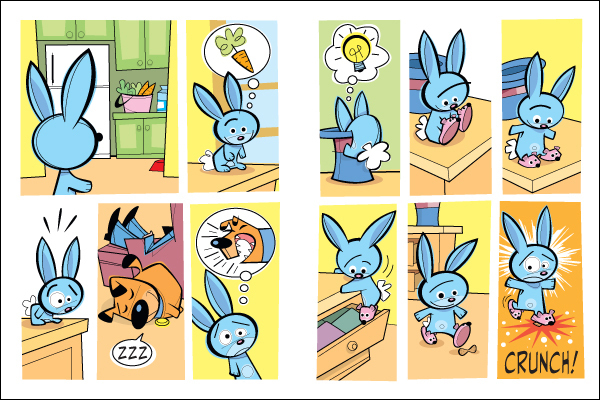 The panels, as you can see below, are full of movement, life, and marvelous color while being simple enough that a young child can carefully follow each joke and twist of the plot. Brilliant backgrounds in yellow, green, pink and blue set off the brightly colored characters and briskly moving plot. While this one isn't an ideal storytime read-aloud, it's perfect to snuggle up with that special child or hand to an older kid to enjoy on their own. Verdict: Highly recommended. Just out of curiosity, does anyone have a graphic novel picture book section? No? Well, it is hard to define them, but this one will definitely get added to my list. All ages will enjoy this funny romp through magic and mishap. 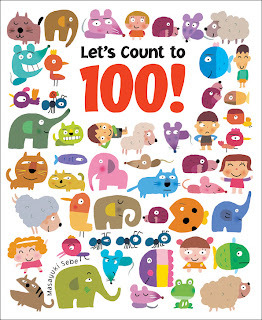 Funny, someone just asked me for a picture book that showed counting to 100 and I couldn't find a thing! Now I'll simply hand them this perfect counting book. 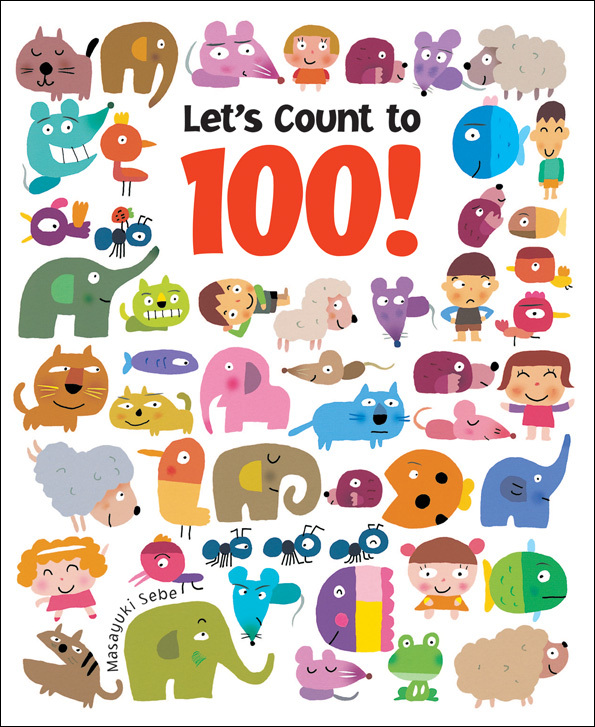 Masayuke Sebe's Let's Count to 100! 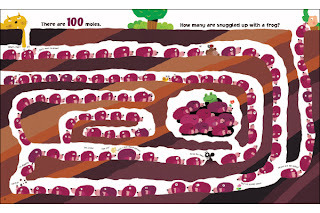 is a perfect introduction to counting to 100 with plenty of visual jokes and secrets for children and adults to enjoy finding. Oh no! It's cats! The mice have got them by the tails, but they don't seem to mind. Can you find all the ones with striped tails? The spreads continue through moles, sheep, birds, fish, elephants, kids, ants, cars and trucks, and finally ten each of everything we've previously counted. A final page shows some of the special things you can find on each page. Verdict: Perfect for small groups, individual children, and parent-child interactions. The pictures are large enough to find some of the fun things with a group, but small enough to cram lots of funny speech balloons and little surprises into the different pictures. A necessity for your concept book collection! Pamela Service is back with a new beginning chapters science fiction series! Josh isn't heroic or even particularly brave. He thinks his little sister Maggie's obsession with acting and Shakespeare is dumb and although he's mad when she stands up for him, he has to admit he's not really any good at fighting back against bullies. He's perfectly content with winning a writing contest with his science fiction story and daydreaming about the stories he's going to write...if he could just get over his writer's block! Then the strange blue rubbery aliens show up...and tell Josh his stories are REAL. Suddenly, he and Maggie are trapped on an alien planet with danger on every side. Will Josh remember enough details from his story - and find the courage - to save the day? Will Maggie's acting come in useful after all? Will they be stranded on Planet Yastol forever? This first installment in a planned series doesn't have quite the delightful touch of the Alien Agent series, which remains a personal favorite of mine. Josh is a much more unsympathetic character, although realistically drawn with his obsessions and dismissal of his sister. The story jumps almost immediately into action and there's really very few "funny bits" which I like to have a generous sprinkling of in all my stories! However, there's plenty of action, interesting characters, and a higher gross quotient which will appeal to those who like a mild ick factor. Verdict: Although not as pure genius as Alien Agent, this is a good, workable start for a new series. Science fiction, especially for young readers, is almost impossible to find and would-be writers will love this, as will young scifi fans and anyone who likes a good adventure with some goop and creepy creatures. Yay! 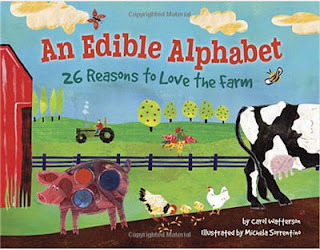 I have read and reviewed all 87 Cybils Nonfiction Picture Books nominations. I have some interesting numbers if anyone would care to share my obsession with statistical data...I don't guarantee all these numbers are correct - tell me if you see a mistake! Also, a reminder that all of my reviews etc. reflect my opinion and not that of the judging committee, etc. And which ones ended up in my library? A companion set to the Thinking Girl’s Treasury of Real Princesses, the Thinking Girl’s Treasury of Dastardly Dames introduces us to six powerful women with a reputation for dark deeds. Each book introduces the subject’s story, with maps and historical information and photographs included. Sections on clothing, food, wealth and other historical segments are also interwoven within the character’s story. 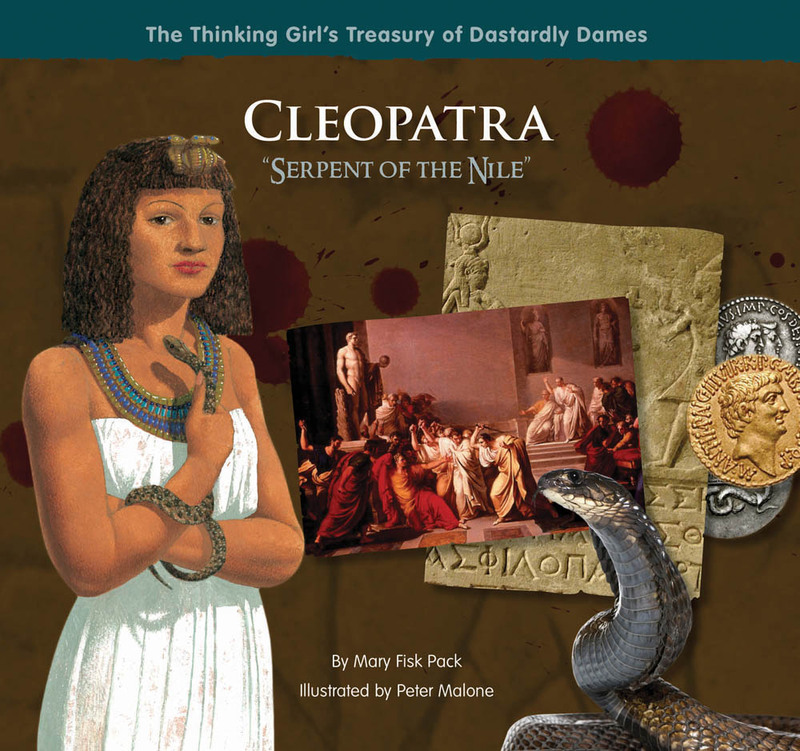 Cleopatra “Serpent of the Nile” is presented with the well-known facts of her life, but Mary Pack goes deeper to find the true queen behind the legends and presents Cleopatra as a powerful woman who struggled to keep her kingdom alive and independent of Rome. Agrippina, daughter of Roman general Germanicus, had a complicated life, but Shirin Yim Bridges does a good job of explaining the convoluted politics of Rome, including the rise and fall of Caligula and Nero, as they affected Agrippina. A final section, “How dastardly was she?” is included that debates which evil deeds Agrippina was really responsible for. 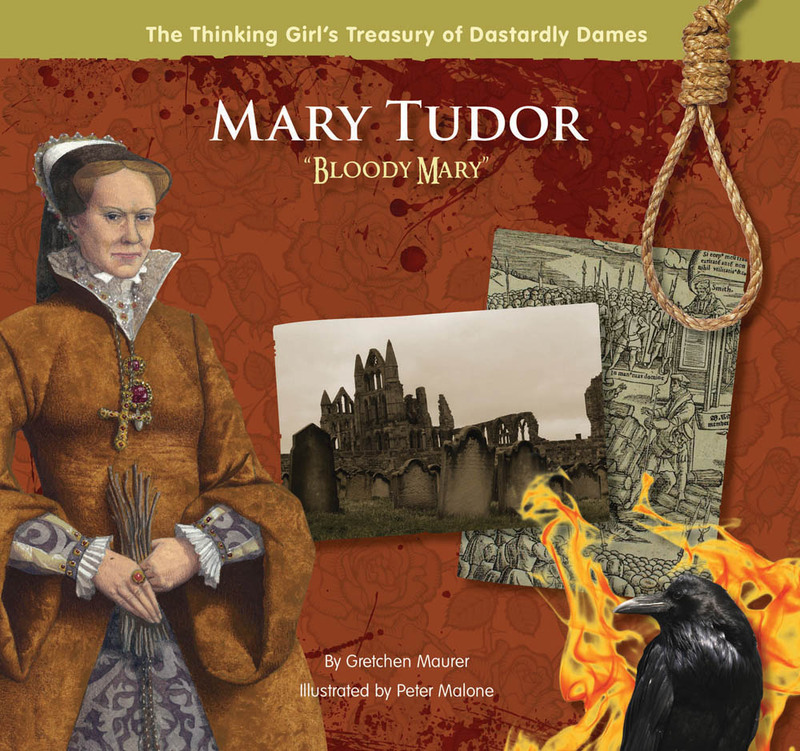 Mary Tudor, known as “Bloody Mary” is given a fresh viewpoint in this account which puts her brief and bloody reign into the context of her miserable childhood and the violent age of the Tudors. Additional information is included on the controversy between Catholics and Protestants and comparisons of Mary’s evil deeds with those of her contemporaries. Catherine de’ Medici, the “Black Queen” of France, first experienced violence when a rebellion left her as a hostage with a precarious future at the age of eight. She had high hopes of a better life when she was married to Prince Francis at the age of 11, but she was considered an outsider and a commoner at the French court. Although Catherine eventually found acceptance, her popularity for the innovations she introduced and the heirs she bore for the throne was short-lived as rumors of poison and black magic destroyed her reputation. Catherine eventually took power and ruled for her young son, but the infamous massacre of Huguenots that she master-minded set off mob violence across the country which she could not control. She was finally overthrown by her son and ended her days the most hated woman in France. Marie Antoinette, another foreign-born French queen, had an equally unhappy childhood and introduction to France, but unlike Catherine she was naïve and helpless, thinking that once she had produced an heir, despite her husband’s disinterest, she had done her duty. Her extravangance when France was starving led to her death during the Revolution and her reputation as a hard-hearted, impulsive, and spendthrift queen. 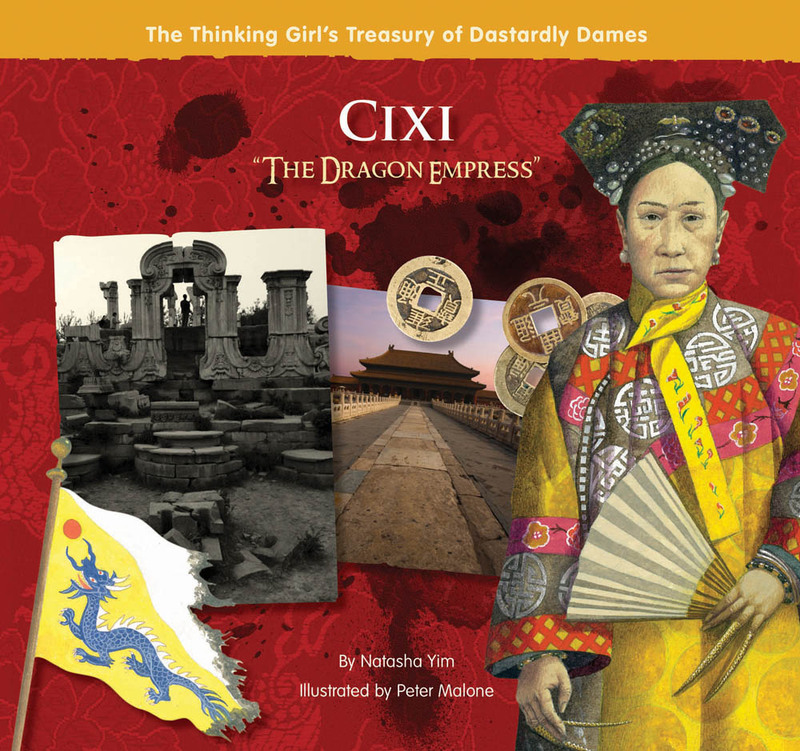 Cixi, “The Dragon Empress,” was happy to become a concubine at the Chinese court, escaping her miserable childhood. Bearing the emperor a son raised her to high status and when the emperor designated her son as heir and she herself as co-regent with Empress Ci’An before his death, she became the first woman to rule the empire in a thousand years. Rumors of poison and intrigues constantly circulated around Empress Cixi, whose cruelty and extravagance fed the unrest of the people. Peasant uprisings gave Western powers a reason to attack and Cixi was forced to flee. She died shortly after the destruction of the massive Summer Palace and Forbidden City. Was Cixi responsible for the deaths of the royal family? No one knows for sure. Verdict: These stories of powerful women with reputations for bloody and cruel deeds are told with a wealth of historical detail, art, and many fascinating additions on clothing, food, and daily life. I would have liked to see sources or additional information for the sometimes colloquial stories included and I thought it was too bad they didn't pick more obscure characters, as in the Real Princesses, but this is a good introduction to a variety of strong women characters in history. Recommended. Yes, my blog is still under construction. When I enthusiastically started reworking and reorganizing it, I didn't expect to lose all internet access (or have to get a new car, or decide to move to a different town over Christmas, or...you get the idea). Anyways, I hopefully will have internet again as of January and then all sorts of beautiful things will happen! I hope. Oh, and cookie decorating went great, very popular, and I had enough of everything! I don't know why this sweet story feels so winterish to me; the illustrations show fallen leaves and a glowing dark night sky, but it just feels like winter. So, I'm posting this review in the winter. A rabbit flees desperately through the woods, "chased by a fox in the dark." No sooner has he safely reached home and locked himself in...when a terrified duck, also escaping from the fox arrives. Then a mouse, then a lamb...the bed is getting crowded and Rabbit is getting annoyed, when there's one more knock at the door. It's the FOX! The animals are ready to run again, but Fox begs for their help - he's lost his mom out in the dark! They've barely calmed down when Fox Cub's mother appears - and she's much bigger and scarier! But she turns out to be nice and just worried about her fox cub, so they all settle down together and discover that Mommy Fox makes a warm and fluffy bed. The rhyming text has lots of words that pop out at the listener, bang, click, thunk, scritch, and a nice repeating refrain of knocking at the door. 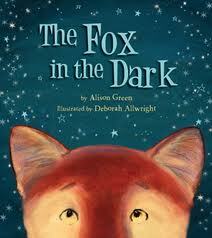 The rhyme swings along easily with the "fox in the dark" repeated frequently enough for kids to join in. What I really, really loved were the pictures. They glow with color and light, despite the whole story taking place at night. Smaller inset illustration shine out of the dark night and the foxes' coats are brilliant, looking so soft and strokable! The layout of the story is superb, moving from full spread illustrations to smaller insets showing the crowding in Rabbit's burrow, then the sudden shock of the fox's face. Verdict: A great choice for storytimes about foxes, rabbits, bedtime, being lost, and autumn (or winter). Highly recommended. This book is just plain fun. In the style of their previous collaborations, Why did the chicken cross the road? and Knock, Knock! Fourteen illustrators give their take on etiquette. Bob Shea instructs readers on the proper way to ride a school bus – no drooling and don’t clean the driver’s teeth, even if he’s a crocodile! Lynn Munsinger illustrates proper cafeteria manners, although her furry pigs don’t seem to be following her good advice. Henry Cole warns against staring – even when you see some pretty funny/icky stuff, especially in the school office. Leuyen Pham has a sweet spread on playground manners. Peter Reynolds illustrates classroom manners with several groups of excellently behaved children and dialogue that sounds like it was written for a teaching special on listening to teacher. Tedd Arnold blasts off into outer space and illustrates good sportsmanship with slug-like aliens playing slime ball. Adam Rex shows a hapless evil scientist trying to instill a few good table manners into his evil monster creations. Judy Schachner has a warm and colorful spread of good manners at a happy birthday party with a huge variety of children and activities pictured. Frank Morrison gives good advice for being a good visitor – which the wild group of kids in the living room don’t seem to have listened to! Dan Santat instructs on proper behavior at the theater – even when it’s grand opera! Joe Berger shows some of the things you should NEVER do in a grocery store. Kevin Sherry gives pool rules, which should be followed even by giant squids. Tao Nyeu has a beautifully embroidered spread…about not picking in public, noses, toenails, etc. 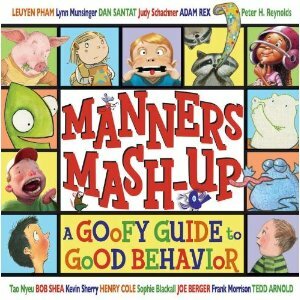 The final pages give the authors a chance to talk about their goofiest manners mishap and gives a brief list of each author's titles. Verdict: This is an amusing book that kids will enjoy looking over, but it’s not particularly substantial and there’s no actual plot to make it a good read-aloud. An additional purchase. 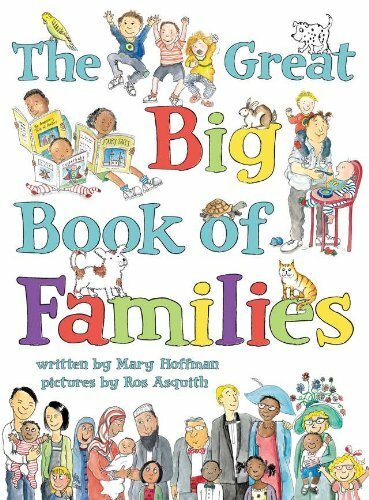 This book explores the many different kinds of families in simple text and cartoonish illustrations. The story begins, “Once upon a time, most families in books looked like this: One daddy, one mommy, one little boy, one little girl, one dog, and one cat.” The author encourages children to look for a family that matches their own in the following pages, as well as to find the cat who appears on every page. The first spread in the main body of the book is titled “Families” and the border is childlike drawings of various families. It talks about the kind of families children might live with – two daddies, two mommies, foster or adoptive parents, grandparents, or single parents. The next spread continues the border of childlike family drawings and talks about “Who’s in your family?”; siblings, relatives, or just two people. 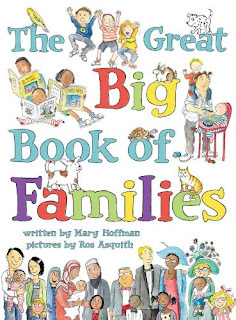 Then the book talks about where families live, go to school, different kinds of work, holidays, food, clothes, pets, family celebrations, hobbies, transportation and how families express their feelings. The book ends with an example of a family tree and a recap of how families are the same, no matter how different they appear on the outside. The cheerful cartoons that decorate the pages include some silly examples (kids using rocket packs in the transportation section for example) and lots of little details to pore over. There’s plenty of humor and honesty in the book, showing a wide variety of cultures, ethnicities, and individual family traditions and behaviors. Verdict: Know your audience – the book does reference two mommies and daddies at the beginning, so don’t choose it for storytime if it’s going to inspire a walk-out of your entire storytime group, but it’s certainly a great choice for your library collection and a good title to hand to parents who are trying to explain family changes to children or kids who live in an “untraditional” family. The text also includes rhymes, facts, silly stories, and more! The final pages include a list of words and images to find throughout the book. The illustrations are bright and colorful, created in collage with acrylic and hand painted paper. Some of the faces are oddly structured, but the overall effect breathes enthusiasm and colorful life. Verdict: This book is packed with so many different things, it’s a great choice for programs, storytime, reading aloud, and display. Highly recommended. Neatly divided clumps of text explain the process of food; growing, harvesting, cooking, preserving, packaging, and shipping for a simple lunch; bread, cheese, tomatoes, apple juice, carrots, chocolate chip cookies, and clementines. The illustrations are bright and cartoony with a tinge of 50s style graphics. Smiling workers are shown farming, harvesting, cooking and packaging food, extra whimsical touches, like the bunnies after the farmer’s carrots hopefully following the boxes of packaged carrots off to the trucks. Extras: A final page explains the importance of a balanced diet and additional food facts are also included, as well as an index. Verdict: This is a nice introduction to the process of food, especially for kids who only see food in a grocery store. But part of me felt the whole thing was too…cheerful. There’s no mention of artificial additives or chemicals and all the workers look happy, healthy, and simply thrilled to be preparing a healthy lunch (and how many kids actually see a lunch like this? Not the kids I meet at the library, who seem to subsist on candy and soft drinks, or the menus I’ve heard announced at the schools, which always seem to be choices between chicken nuggets, pizza, and fish sticks.) On the other hand…this isn’t meant to be a book about sustainable farming, environmental concerns, organic food, or healthy eating. 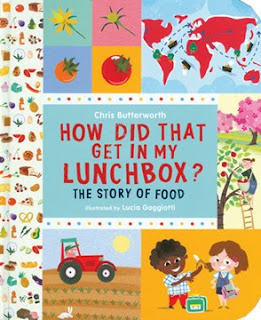 It’s a simple introduction to how food gets from the land to your lunchbox and its cheerful images are suitable for early elementary students learning about this subject. I’m on the fence on this once, you’ll have to supply your own verdict. Verdict: I’ve read this in multiple story times and it never fails to raise a giggle from parents and delighted enthusiasm from kids. Be prepared for them to want to investigate the photos more closely, pointing to different vegetables and colors. Have them try out unfamiliar names and point to their favorite vegetables. 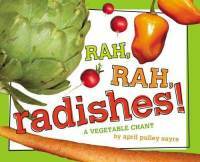 This would also be a great read-aloud in a healthy eaters class! Highly recommended. 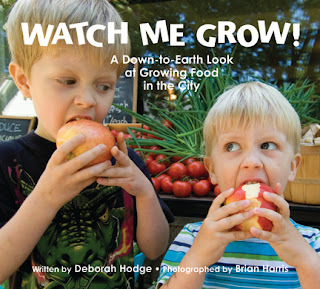 I loved the previous book by Hodges and Harris, Up we grow, but this one is even better. Based in Vancouver, this book shows how gardens can grow anywhere – even in a city. 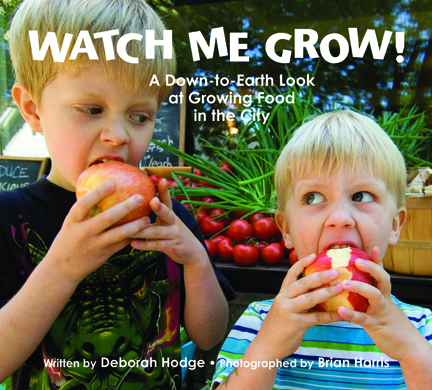 The book is divided into four sections; Growing, Sharing, Eating, and Caring. The growing section shows the many places in the city where gardens are growing and the people who are caring for them. There are suggestions for small spaces to fit in a little garden, like herbs on a sunny windowsill. Animals in the city are also included, like chickens and bees. Sharing talks about the ways people share land and crops; in community gardens, with city farmers, and with wildlife. Eating celebrates the deliciousness of fresh-grown fruit and vegetables and talks about ways to harvest, preserve, and share crops. The final section, Caring, talks about how growing gardens together not only cares for the land and nature, but also builds community relationships. A final note about the book explains a little more about urban agriculture and lists the gardens and groups pictured throughout the book. Verdict: This book is a great starting place for simple gardens, whether you live in the city or the country. It has great ideas for tucking growing things into small spaces and building community through gardening. And lots of great photographs of kids and adults working in and enjoying their gardens. (Incidentally, this is also the book that sparked off my dormant desire to move out to the northwest coast when I read it last year and I moved that goal back to the top of my list)…Highly recommended! 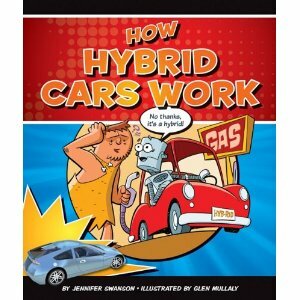 Cartoon-style illustrations and some comic panels help explain how a hybrid car works. Photos, timelines, and more show the history and evolution of hybrid cars, back to when cars ran on steam to present-day electrical hybrids. Information also includes greenhouse gases and how hybrid cars help decrease pollution, as well as alternative fuels. An index, glossary, and link to the publisher's website for more information are also included. Verdict: There was a lot of information in this book, but the organization was a little confused (this may be because I read it as an electronic pdf). I really didn't care for the mix of fuzzy photos (again, could have been epub) and cartoon-style illustrations. Also, this is one of the publishers who charge an arm and a leg for library-bound nonfiction, which will be outdated in a few years. An additional purchase if you have interest in alternative energies. A confused jumble of rhymes that supplies no actual information. The pictures are passable, but can't make up for the bewildering text which offers a series of comparisons and then tells the reader to find out on their own what relativity is. Not worth reading.